IN THE early days of the Revolution, the Olympics were an event for amateurs. When the concepts of developed capitalism managed to infiltrate the Olympics, sports stopped being a health and education issue, which had been its main goals throughout history. 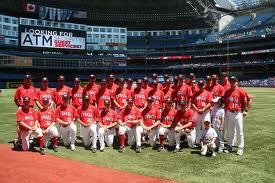 HALIFAX (March 15, 2009) – BASEBALL CANADA, which extensively collaborates with the Toronto Blue Jays, capitulated to the U.S. baton in the preparatory meetings of the baseball federations to organize the Classic and became one of its first casualties. I TRY TO FOLLOW the details about the Baseball Classic through our national television. The game between the teams of Japan and South Korea, Cuba’s two strongest rivals, which was played today, Monday morning, was 1 to 0 in favour of South Korea when Japan had only two more chances at bat.